Wine list at the wine bar in Santiago's marketGalician wines are exported internationally. You are likely to find two things at family Christmas dinners throughout Spain: seafood from Galicia and a bottle of Galician white wine. 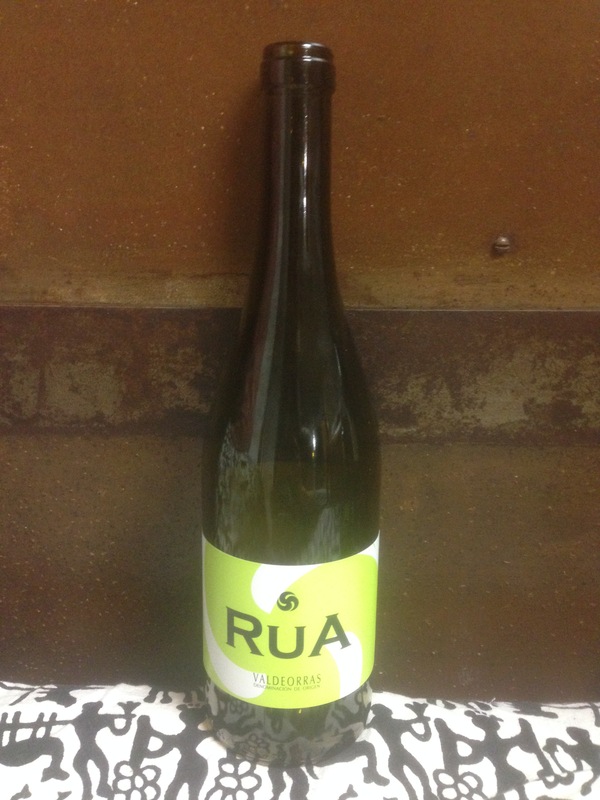 While reds from the La Rioja and Ribera de Duero regions dominate international exports, for white wine Spaniards prefer Albariño wines from the Rías Baixas. Nowadays, other white and red wines from Galicia are gaining national and international notoriety: President Barack Obama picked a Galician red wine for a congressional dinner two years in a row. Wine culture was introduced by the Romans and has continued more or less unabated for two thousand years. During the Middle Ages, wine production in Galicia was led by religious monasteries that built terraces, maintained vineyards, and sold land holdings to lay persons who agreed to produce wine and give some of it back to the monasteries. Galician wines were exported to England and Italy in the sixteenth and seventeenth centuries. However, a devastating blight crippled wine production in the mid-1800s and the Spanish Civil War in the 1930s severely affected the Galician wine industry. The overwhelming majority of wine produced since has been for self-consumption, not export. It was not until the last several decades that Galician wines have started to make wine connoisseurs across the globe take notice. The provinces of Ourense and Pontevedra are the centers of wine production in Galicia, with the southern half of Lugo province also an important wine growing region. It is in these provinces where the Miño River and its tributaries cut through deep canyons, flow by undulating hills, and eventually empty into the Atlantic Ocean via the numerous estuaries–rías–along the coast. The Miño, the Atlantic, the mountains and hills, and the weather combine to give Galician wines their unique character. The most notable wines are whites due to moderate temperatures, high humidity, and heavy rainfall–more than fifty inches per year. While the weather works against red grape varietals–few are able to fully ripen–their popularity is growing as wine drinkers look to alternatives in a Rioja-saturated market and as Galician wine producers are making intriguing reds. Another unique aspect of Galician wines are the grapes themselves. While other wine regions in Spain turned to grape varieties popular in other countries, many growers in Galicia have maintained indigenous grapes and saved some from near extinction. The “star” grapes used in the five Galician wine regions are all native to the area. The Rías Baixas Denominación de Origen (D.O.) is the largest and most well known wine region in Galicia. The region is named after the estuaries that empty into the Atlantic Ocean on Galicia’s western coast–rías baixas means lower estuaries. Most of the region falls in the province of Pontevedra, with a small part in the province of A Coruña. The de facto capital of the Rías Baixas D.O. is Cambados, a quiet and quaint village. The grapes are grown on vineyards close to the sea, giving the wines a distinct Atlantic character–crisp and fresh. Mild temperatures, heavy rainfall, and dry summers lend to better production of white wines, mainly from the native Albariño grape. Albariño wines from the Rías Baixas D.O. can be found on supermarket shelves around the world. Albariño makes up over ninety percent of the wines produced in the Rías Baixas. The Albariño grape is possibly related to Riesling (Germany) and Petit Manseng (France). While it is used in blends in other Galician wine regions, the Albariños made in the Rías Baixas are usually 100% Albariño. They are bright, zesty, and crisp with clean flavors of rich, ripe fruit suggesting peach and apricot. The Atlantic character can be noted with a seashell mineral character. Albariño wines pair excellently with seafood, such as clams and mussels found in the region’s estuaries. Notable producers are Martín Codax, Condes de Albarei, and Paco & Lola. If you wanted to spend a vacation touring all of Galicia’s wine regions, Ourense would be the ideal base: it is close to the Rías Baixas and the other four D.O. regions are located in the province. The Miño River flows through Ourense and the Sil Canyon–formed by the Sil River–is less than thirty minutes from the city. Both rivers are the arteries of the Ribeira Sacra D.O. The name of the region means “Sacred Shore” in Galician, taking its name from the numerous medieval monasteries that dot the landscape. While Romans introduced vine growing in the region two thousand years ago, it was the monks that made wine culture integral to the Ribeira Sacra region during the Middles Ages. The monks built vertiginous terraces on the slopes of the river canyons. They also sold land to local people with the agreement that wine produced on the lands would be sold back to the monasteries. The terraces are so steep and the spaces so small that mechanized labor is impossible, thus coining the term “heroic viticulture” as the grapes must be harvested by hand and carried up and down the tough terrain. The wine region encompasses parts of the provinces of Lugo and Ourense, with Monforte de Lemos (Ourense) and Chantada (Lugo) the main population centers. Unlike Galicia’s other wine regions, reds are the main wines bottled here, with the Mencía grape receiving top billing. Mencía from Ribeira Sacra D.O. Mencía grapes are also native to the region and produce a red wine distinct from the tempranillo grape that is the most common grape used in Spanish red wines. Ribeira Sacra growers produce a wide spectrum of contrasting Mencía wines. Traditionally light, pale, and fragrant, winemakers are now making more concentrated and complex Mencías. These wines are deeply fruity with a medium body, powerful and earthy with a mineral character derived from the slate or schist soils. A deep red with hints of violet color, Mencía wine evokes floral and red fruit flavors like strawberry, pomegranate, or sour cherry; a hint of black licorice might be noticed. Wines are mostly 100% Mencía but some growers use the grape to blend with Brancellao, Merenza, Sousón, or Caíño Tinto, all native to Galicia themselves. A bottle of Mencía is an excellent accompaniment to cured meats like chorizo or jamón or the famous Galician-style octopus. West of the Ribeira Sacra, at the confluence of the Miño, Arnoia, and Barbantiño Rivers, is the Ribeiro D.O. The Ribeiro region is the second oldest D.O. region in Spain–Jerez in Andalucía is the oldest. Ribadavia, the capital of the Ribeiro region, is a beautiful Galician town with an historic Jewish Quarter. Wines from the Ribeiro have a long, celebrated history: Miguel de Cervantes wrote glowingly about their renown in Europe and they were heavily exported to Britain and Italy in the seventeenth century. The region is sheltered by mountains, creating a warmer and more humid climate. Vineyards cling to steep valley sides and sprawl over sloping hills right up to the riverbanks. White wine makes up eighty percent of Ribeiro D.O. production. 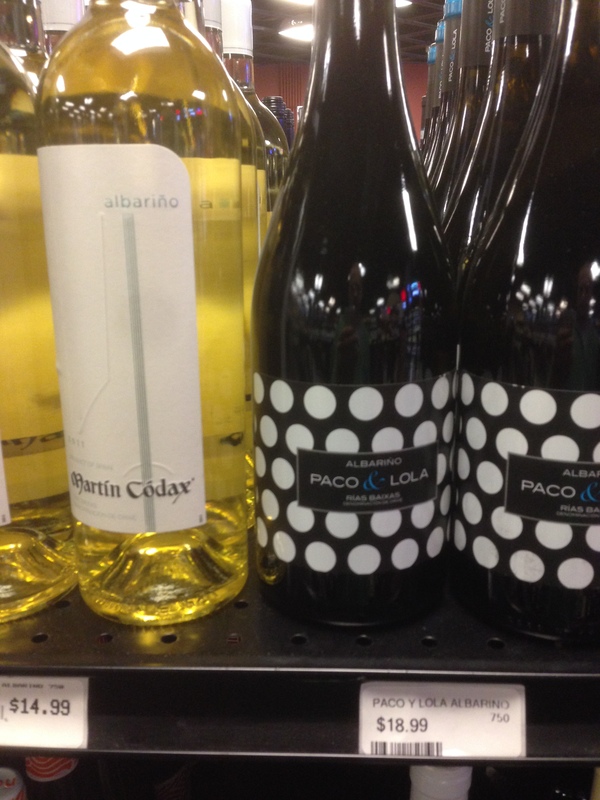 The whites–similar to Portuguese Vinho Verde wines–are light, dry, fresh, and less sweet than Albariño wines and have less alcohol content that other white wines. Red wine is produced in the Ribeiro but mostly for self-consumption and they are always young wines, drunk within the first year after bottling. 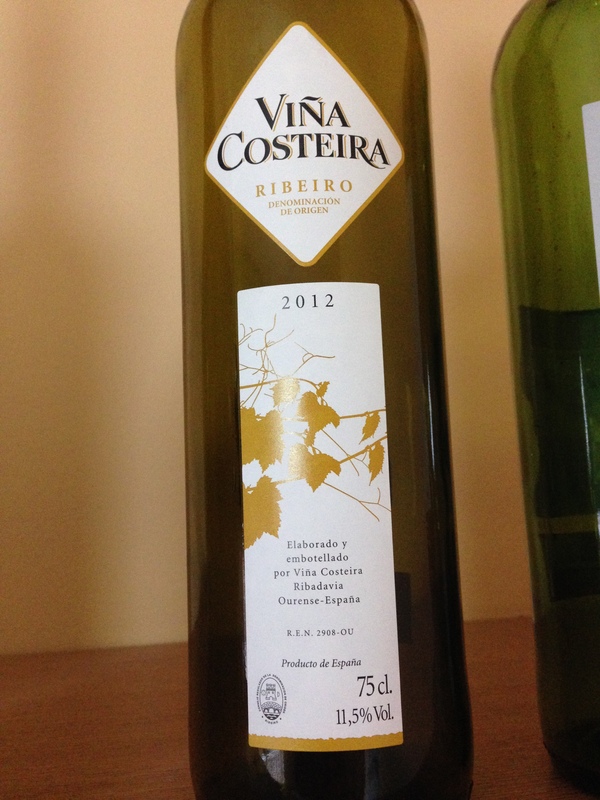 Viña Costeira, a popular wine from the Ribeiro D.O. The Treixadura grape is the staple of Ribeiro wines. It is often blended to Torrontés and Lado wines to add body and lemon aroma. While similar to the Albariño grape, Treixadura produces a light, fresh, smooth, and soft dry white wine that is not as sweet as its more famous neighbor. The grape invokes citrus fruits, white flowers, peach, and apple. For reference, Ribeiro wines blended with Treixadura grapes are similar to a Pinot Gris. These wines are perfect accompaniments to seafood, salmon, or chicken. The Valdeorras D.O. is the second oldest Galician D.O. region but not as well known as the previously mentioned three, perhaps due to the lack of a significant population center to promote wines made in the region. Valdeorras wines are grown in the eastern part of Ourense province, bordering the better known Bierzo wine region in the province of León (Castile and León autonomous community). The region is mountainous and is Spain’s main producer of slate, which has led to more use of Mencía grapes that produce quality wines in slate soils. 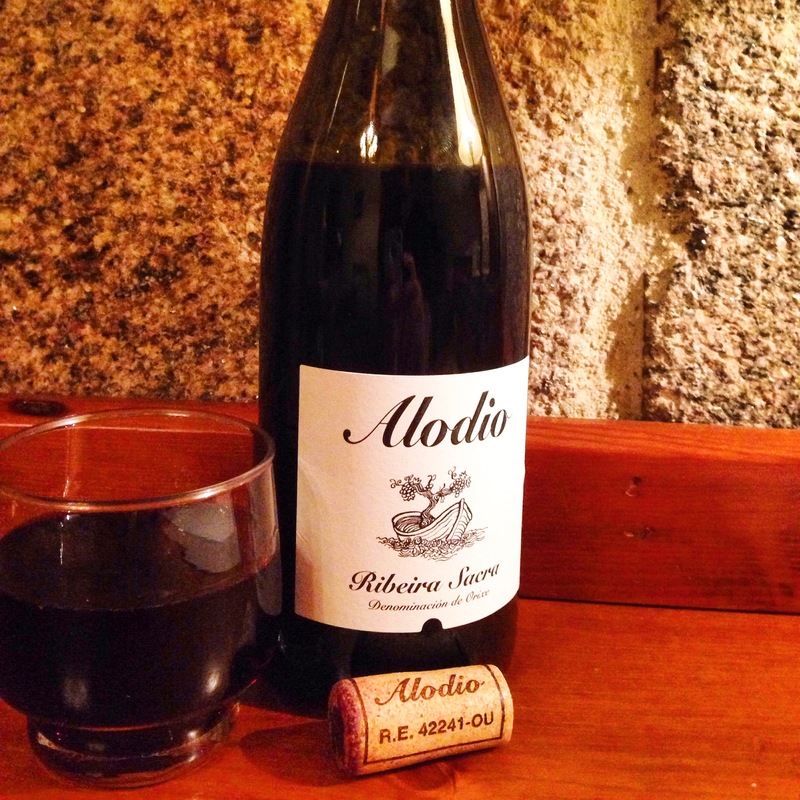 Godello blend from Valdeorras D.O. However, the grape of note in Valdeorras is the Godello. It nearly went extinct in this region as Palomino and Garnacha grapes were mainly grown here after the nineteenth century blight. Godello is usually combined with Albariño or Treixadura when it is used in blended wines. The wine is best aged in steel tanks, giving them a fresh and lively character. The slate soils of the region make a juicy, mineral wine that is acidic, dry, dense, and complex. Godello wines have more body than Albariños, thus they are better with winter foods such as lacón con grelos. Godello wines have similar qualities to Chardonnays. Despite a long history of viticulture, the Monterrei region is the least known of Galicia’s wine regions. It is also the hottest in the summer and the coldest in the winter. Needless to say, there is a lot working against wine producers in this region but despite this they produce some noteworthy wine. There is not one grape that overshadows others. Instead, the vineyards on the steep slopes of the Támega River valley grow Godello, Treixadura, Mencía, Caíño Blano, and other grapes. Other parts of Galicia also produce wine in addition to the five Designation of Origin regions. Some notable viños da terra (table wines) are from Betanzos (A Coruña), Valle del Miño (Ourense), and Barbanza-Iria (A Coruña and Pontevedra). Also, many Galician families maintain vineyards on small properties and produce wine for their own consumption.